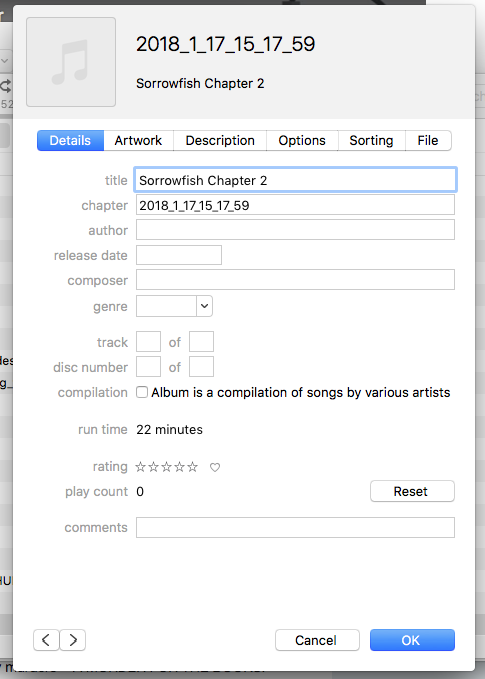 Ok so I’m reading out loud to edit Sorrowfish and I’m recording it. I wanted to show you guys what I’m doing in case anyone wants to do the same. 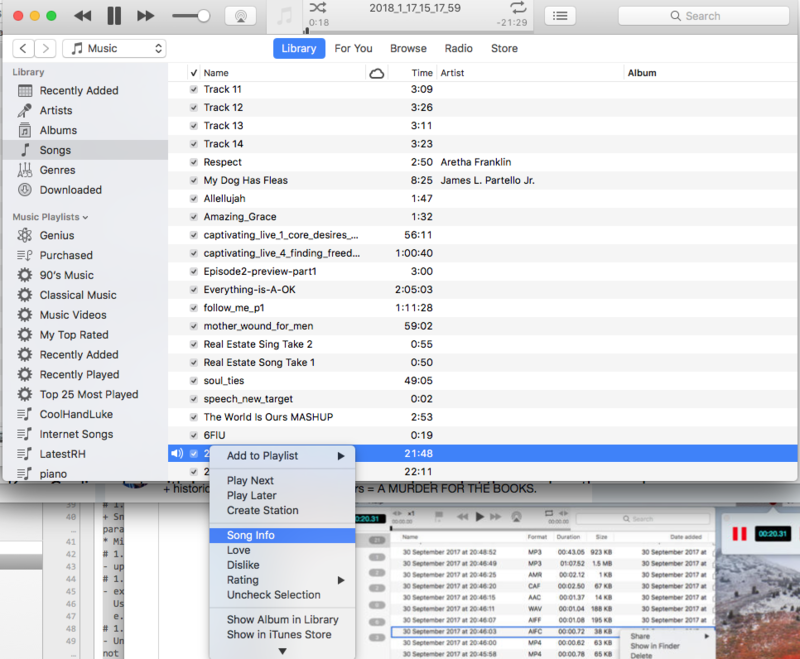 I’m using a Mac mini and an ipad for this and am making mp3s.You don’t actually have to make mp3s at all, I’m just making them so I can post them here and send them to my mom, who demanded to get them after she found out I was doing this. Her eyes are going bad and she wanted to read my draft, but hasn’t been able to. She’s also tech challenged. So I got this idea from doing screencasts for my business with my iPad. I love the tutorial below, you can make some really cool things using this technique. If you want to make some interactive storyboards this way, maybe for a children’s book you could with Keynote. I used this method a few years ago for a screencast and so I already had these apps. You can use any recording app. 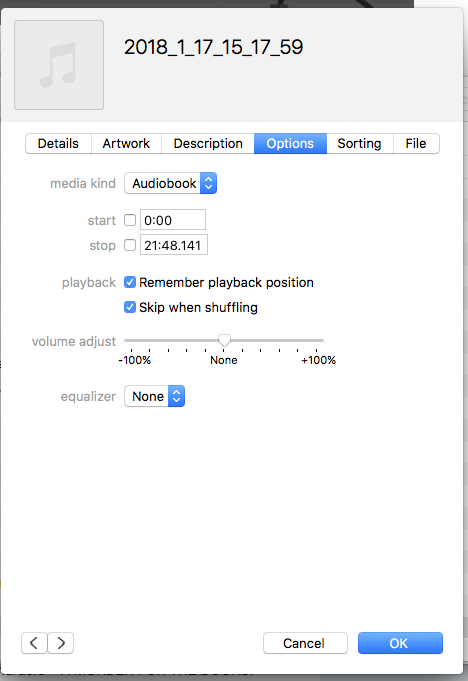 One that exports to mp3 will allow you to skip my next steps. No I don’t have a microphone. When I do a pro audiobook I’ll hire pros. (But yes. I do voices sometimes because I’m trying to read it as it is in my head. So that’s fun.) 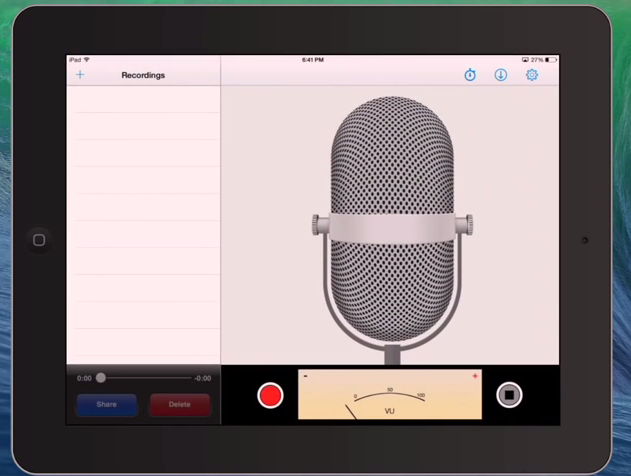 This particular app can save as video to your camera roll which means you can do voiceovers with it on an old ipad. The app is older too. As I stated before, any voice app will work. 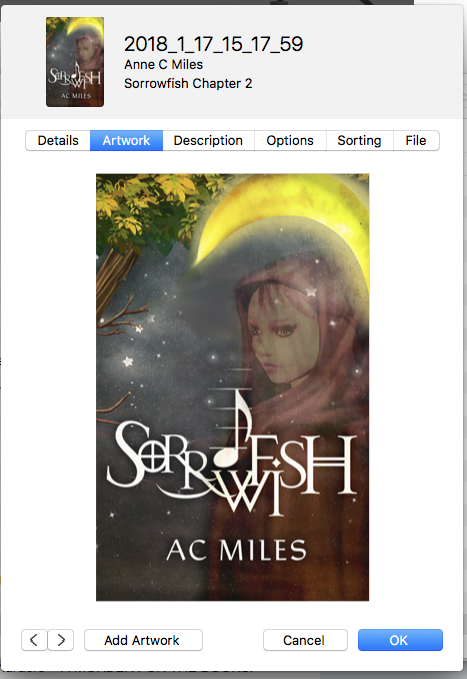 You can just export to mp3 in many of them, but the extra step I’m taking gives the file a fun icon of my book cover in iTunes and other apps. 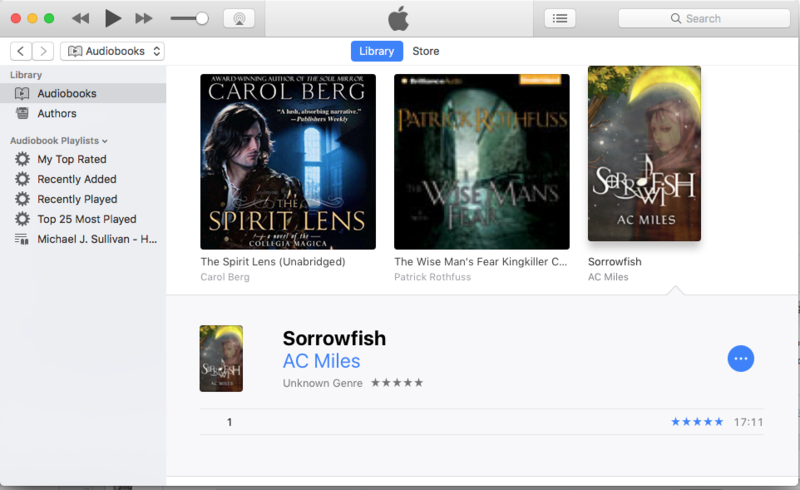 It adds a bit of a thrill to open up iTunes and see it there, plus mom gets a kick out of it. 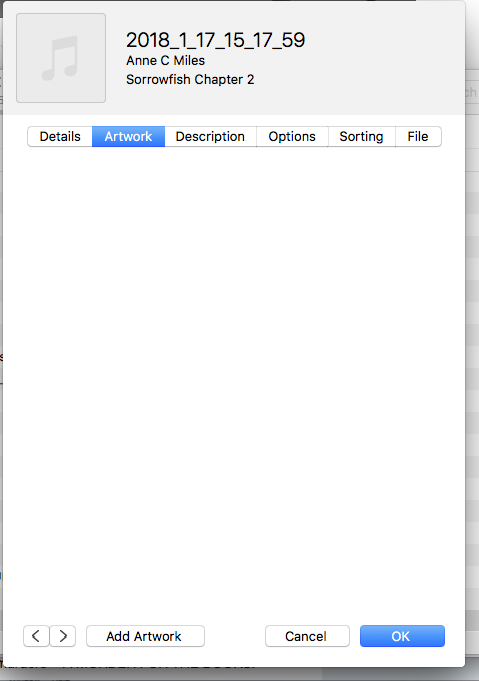 When you’re all done the file will look like this in iTunes and other apps. 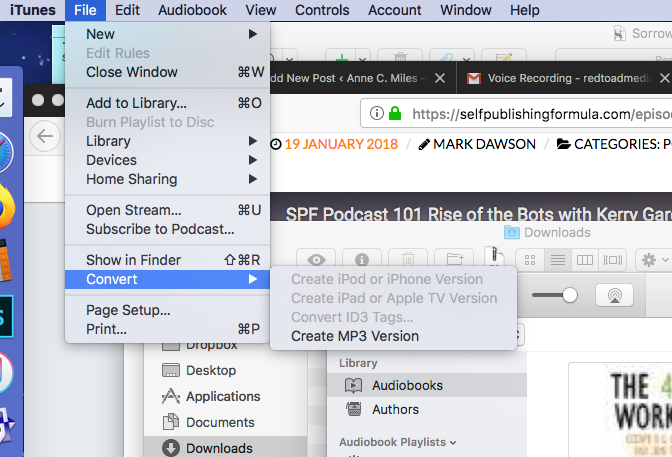 If you don’t care and can export as mp3 from you’re iPad app then proceed directly to sharing. Otherwise, keep reading. Tap share and email it to yourself or you can import it by hooking it up to your Mac directly. If you hook it up directly, the voice file will be in Photos. I email it to myself because its easier to get the file from Downloads, and back it up to Google drive right in my Gmail. This is an extra step but worth it to me to see my book cover and to help mom better deal with the file. 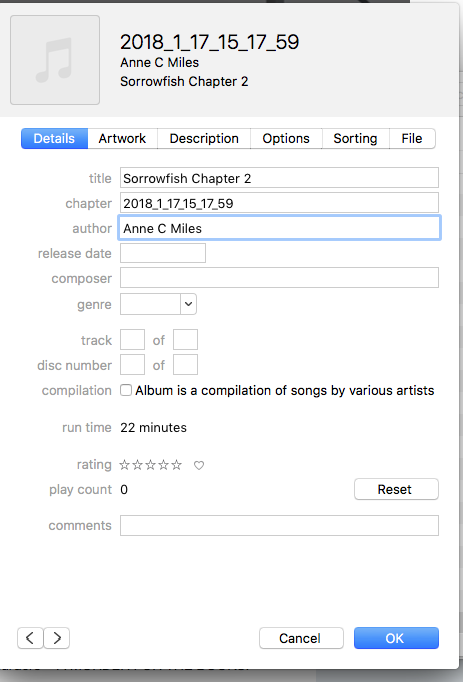 She can find “Sorrowfish – chapter 1” with the icon a lot easier than she can find the file with a string of numbers as a name.You’ll need to check your iTunes import settings or you won’t be able to export as mp3. 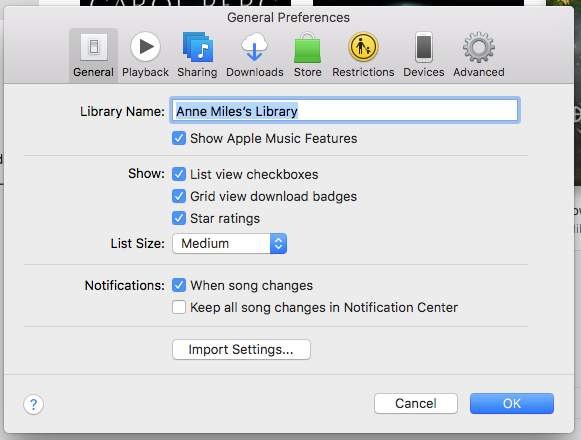 Open iTunes, go to preferences. 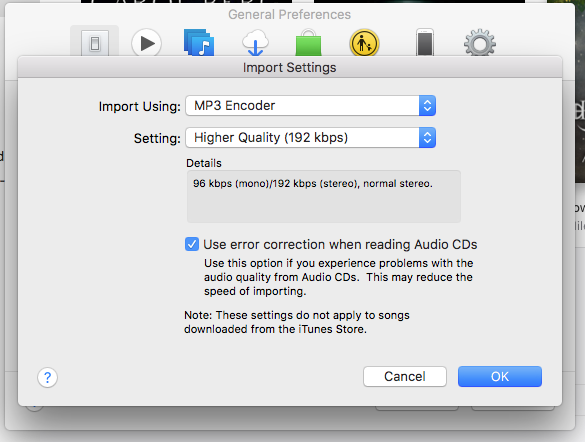 Change it from AAC to mp3 encoder. 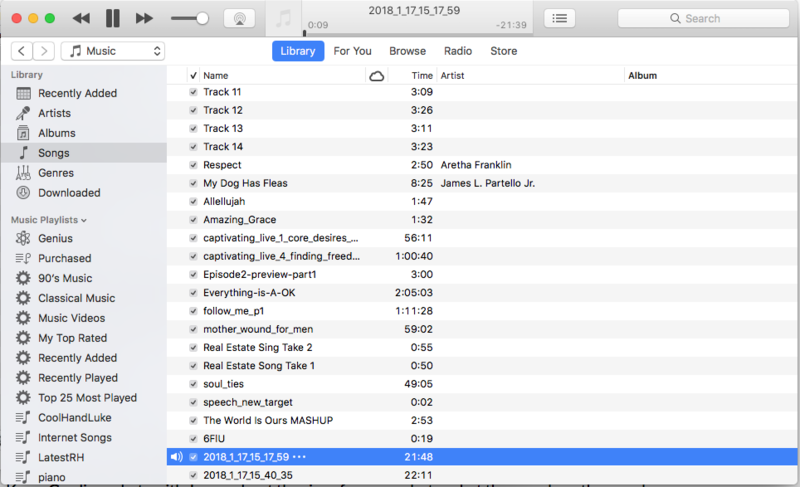 Hit ok. Then, still in iTunes, hit command-O or go to File > Add to Library and navigate to your audio file in your downloads (or Photos if you imported directly) This will place the file in the list of songs, thusly. It will be named a string of numbers and will likely start playing. Now you’re going to add the fun by changing the file info. 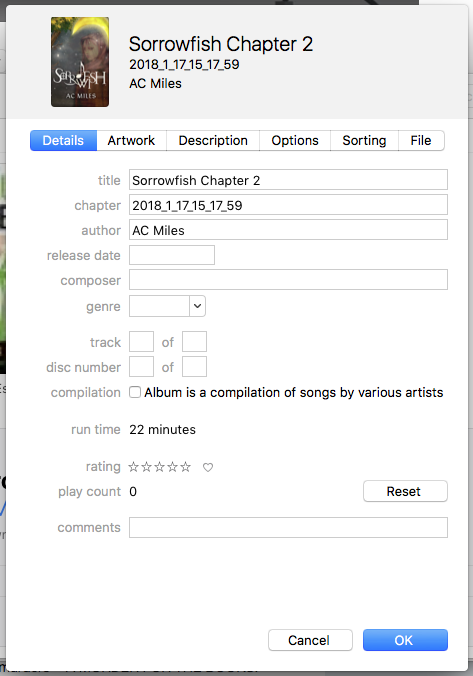 When you first open the file, iTunes will give you the file info for a song because it doesn’t know you’re making an audiobook. You have to tell it. When you do this, it will change the other form fields. Now you have “title” and “Chapter” fields to fill in on the Details tab. Also …Author! how exciting. So fill those in. 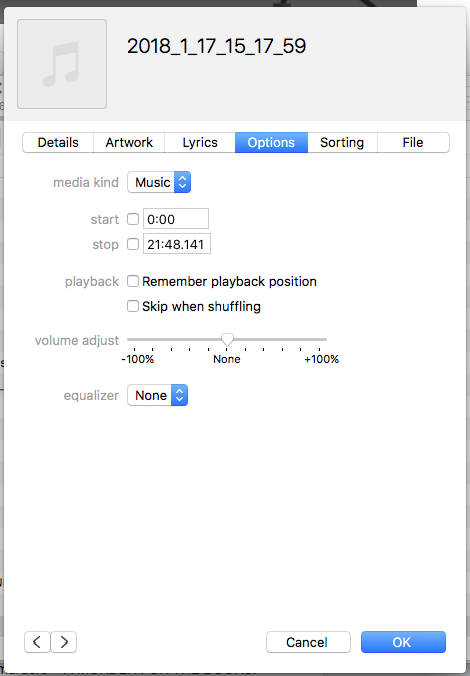 See how it adds an icon in the Song info tab? Cool! Now you’re going to saver this as an mp3 and then you can send it to your mom like I did or upload it to Soundcloud or heck, just use it to listen to and edit with. Because believe me, the places you need to edit will become PAINFULLY apparent when you read your chapters aloud and play them back. Go to File > Convert > Create Mp3 version. 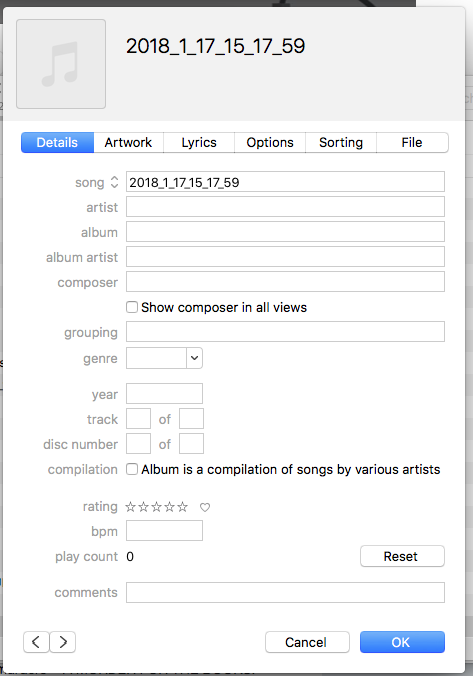 If you don’t see that option or it is greyed out then go back to step one above and fix your preferences and reimport the file and re-edit the song info. If you don’t do that you won’t have this option. Ok so where is the file? Seriously. It’s buried deep in a subfolder. Move that puppy to your documents or desktop or whatever. Wow. You’ll probably have a string of numbers for the filename too. Rename it so you can recognize it and your 70+ year old mom can too. When you’re all done then you can upload and let your family and friends mercilessly mock your voice performance and accent. But hey, it’s worth it for the editing boost. You can see why if you listen to my finished product. Places where I obviously trip or am awkward in my reading are places I need to edit. I also catch inconsistencies more easily when I listen to the playback. I hope this helps you and hey, if you do this, send me your file to listen to! I’d love that!